Also called conference interpreting and UN-style interpreting, simultaneous interpreting is primarily used in formal group settings, including diplomatic conferences, conventions, courtrooms, meetings, tours and seminars. Whether you need simultaneous interpretation services in one language or several, we provide professional linguists for virtually any situation, as well as the simultaneous interpretation equipment you need to make any meeting a success. Our interpreters are available around the world in more than 200 languages and dialects (including American Sign Language), and have a specialized vocabulary acquired from years of experience in their chosen industry. Simultaneous interpretation renders speech from a target language into a source language in real time. 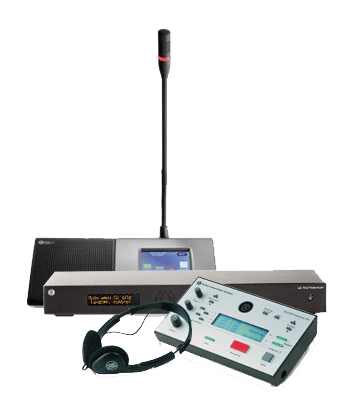 For many proceedings, this requires simultaneous interpretation equipment such as wireless headphones and soundproof booths that allow the interpreter to see the speaker and watch for non-verbal forms of communication. We offer simultaneous interpretation equipment rentals for venues and gatherings of any size, from meetings to conferences. Soundproof booths, wireless receivers, and microphones will ensure that interpretations of the highest quality are available to speakers of other languages. Our trained audio engineers are available to plan, install, maintain and operate audiovisual and simultaneous interpretation equipment on-site to facilitate a successful conference. They also offer on-site recording and videography services and can duplicate the recording after — or even during — your event. With Accredited Language, you get not only the equipment, but also the service to back it up.